A recent development, Template Assisted Crystallisation (TAC), has produced the first effective chemical-free scale prevention method. 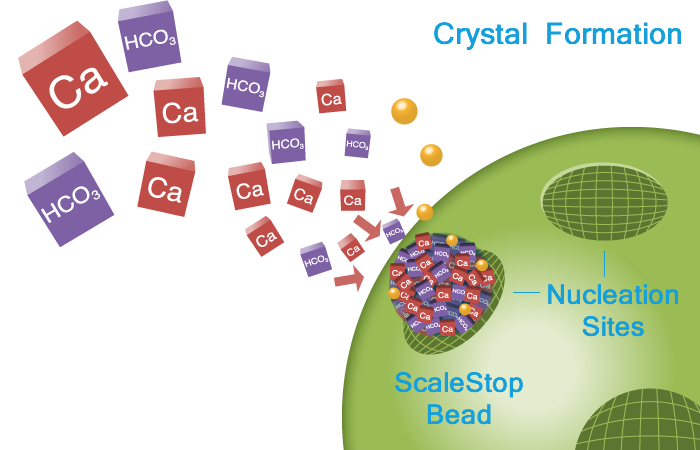 Based on TAC technology, Next Scale Stop converts hardness minerals into harmless, inactive microscopic crystals. The graph above and the table below are taken from 2013 independent evaluation using the German DVGW-W512 testing protocol. It is clear that Next Scale Stop TAC technology was the most efficient at reducing scale over the whole range of water qualities tested. In this evaluation, ion exchange (IX) was also tested, which gives a true comparison of IX to alternative devices and technologies under exactly the same conditions. The graph shows that both TAC and IX had the highest effiency, with TAC performing better than IX. At the lowest challenge (TDS 479 and CaC03 180) TAC had an effiency of 99.6% and at the highest challenge (TDS 1200 and CaC03 500) 90% effiency. In all water samples, other alternative devices (water conditioners) only achieved 50% and below, with electro/magnetic being the worst. TAC is exceptionally efficient, it saves money, saves water and does not harm the enviroment. 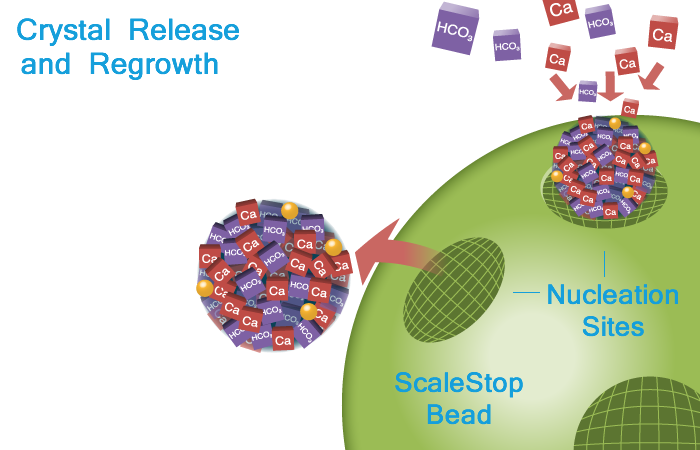 The evidence shows that Next Scale Stop TAC is equally as efficient as ion exchange water softners at preventing the formation of scale, and has the added benifits of no salt use, no water waste from regeneration, and importantly, no harmfull brine discharge into drains, groundwater and the wider enviroment. Each water quality has a unique make up of a total dissoved solids and hardness levels. Next ScaleStop TAC operates in upflow. This creates a column of active TAC media in the cartridge or tank which allows for maximum contact time and provides optimum conditions for crystal formation.